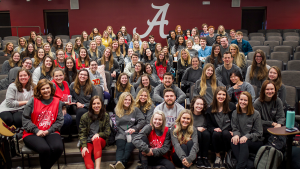 Capstone Agency, The University of Alabama’s nationally affiliated, student-run communications firm, held its third annual CreateAthon Friday, Feb. 1. The 24-hour integrated communications marathon amounted to 2,208 hours in donated work for 15 Tuscaloosa-area nonprofits. As a national 501(c)(3) organization, CreateAthon unites professional and student-run communications teams across the nation to serve in 24-hour marketing marathons. To date, CreateAthon has delivered $24 million in pro bono services for more than 1,500 organizations, with a mission to deliver $100 million by 2020. Each nonprofit came to the agency with a communications problem; whether it be a lack of awareness or an inconsistent visual identity, and over 90 students worked through the night to deliver solutions to these deserving organizations. Smile-A-Mile development director, Savannah DeRieux, was grateful for the content and strategy pieces Capstone Agency developed for the organization. “They took our need and the broad scope of what we are doing with our organization and put it into a campaign that we are going to use,” said DeRieux. The 15 nonprofits selected include: Alabama REACH; Arts n’ Autism; Big Brothers Big Sisters of West Alabama; Boys and Girls Club of West Alabama; Camp Fire Alabama; Caring Days Adult Day Care; Dialysis Clinic Inc.; Freshwater Land Trust; Schoolyard Roots; Smile-A-Mile; Sweetwater Outreach; The University of Alabama Collaborative Arts Initiative; Tuscaloosa SAFE Center; United Cerebral Palsy of West Alabama; YMCA of Tuscaloosa.